So, after a week since my first attempt at training for the marathon, my Achilles tendon has gotten worse and not better. 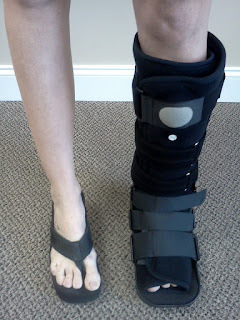 I decided to go see my Ortho doc today and I left with this boot. Basically, I have pulled my Achilles tendon (which I already knew) and likely have a small tear as well. I am to ice and stretch and wear this lovely accessory for 2 weeks and then see where we stand. Hopefully that will do the trick, but based on the severity of the tear it may take up to 6 weeks to fully heal. Me not happy. I know what you are thinking. "Now she has her out! She hates to run so now she can quit.....glad I didn't send her that $20 quite yet!". When God wants you to do something and you DON'T DO IT, you end up getting swallowed by a large fish. That's in the Bible.When God wants you to do something and you DO IT, Satan will be at your door with an injury, a financial setback, a challenge with your schedule, discouragement from others and any other number of temptations and challenges to keep you from accomplishing God's purpose. That's in the Bible too. I will be at the Chicago Half Marathon in September and I will finish it one way or another. This cause, and my commitment to do God's will and stand in the gap for the least of these, will not be thwarted by a silly old boot. I may just throw some wheels on this bad boy. So, click the logo above and pitch in your $20 via Paypal for Project Hopeful (just click the "Donate" button above my name)! My goal is to get 100 of my 600+ Facebook friends to donate $20 each....what a big impact we could make on the lives on HIV+ orphans a children around the world together! Carolyn and I want to use your blog posts to advertise for the run. Okay? PUH-LEASE say yes!!! Is that seriously a question? Girl you can use whatever you want of mine....no "yes" required! Well....except maybe my toothbrush. And deodorant.